Thank you so much for your interest in fostering kittens for Spay and Neuter Kansas City. SNKC currently rescues and cares for over 100 kittens each spring. Most of them are either abandoned, given birth to by feral moms or just relinquished as an unwanted litter. By opening up your home to foster kittens, you’re not only helping to save lives, you’re providing the individual attention and care these kittens desperately need. Kittens are some of the most at-risk pets because they require intensive around-the-clock care, and many shelters don’t have the resources or staff to provide that level of care. Fostering to help kittens through Spay Neuter Kansas City helps keep the kittens healthy until they are ready to enter our local shelters to find a forever home. Once you have completed your foster application online, our Families Better Together Outreach Member will send you a foster program manual and agreement as well as invite you to join the SNKC Foster Group Facebook Page. This is the main line of communication in notifying foster homes of needs, keeping foster homes updated on program, sharing information and important program news and needs for the entire group. All foster homes interested in neonatal care of kittens must complete a training session to accept neonatal/bottle fed kittens into their home. Foster homes are asked to provide care for the kittens and provide transportation to and from appointments as needed. 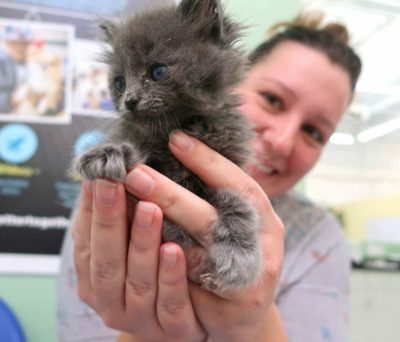 Once the kittens are old enough and weigh enough to be spayed or neutered (typically two pounds), you’ll bring them to Spay and Neuter Kansas City Pet to be fixed and they will be transferred to a local shelter or rescue group for adoption. Care for foster kittens includes a strict feeding schedule, cleaning, and lots of snuggling and play time. Although fostering kittens is a lot of work, it is a very rewarding experience. By participating in this program, you are saving lives and helping kittens find families. Ready to sign up? Submit your Foster Agreement!